On September 19, we launched our 2017–18 season with a concert saluting the virtuosos who make up the New York Philharmonic. They performed Mahler’s Symphony No. 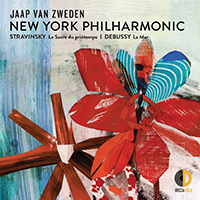 5, led by Music Director Designate Jaap van Zweden. It was broadcast live on Facebook, the Philharmonic’s fourth live concert broadcast on that medium. Hosted by Alec Baldwin, the broadcast takes you inside the hall for a complete performance of Mahler’s Fifth and a chance to meet our new President and CEO, Deborah Borda. Enjoy this archive video of the broadcast, which will be available for 45 days. This just in: Mahler and the Philharmonic will continue to groove in 2020. Today it was announced that the Philharmonic and Jaap van Zweden, who becomes Music Director in 2018, will open the Mahler Festival — held every 25 years — in Amsterdam in May 2020, presented by The Royal Concertgebouw. They’ll perform Mahler’s Symphony No. 1 in the festival’s opening concert in the Concertgebouw, part of the Orchestra’s first European tour with Jaap van Zweden in spring 2020. 2020 will mark 100 years since the first Mahler Festival, honoring the 25th anniversary of legendary conductor Willem Mengelberg as chief conductor of the Concertgebouw Orchestra. The Philharmonic enjoys a special connection with both Mahler and Mengelberg: they both served as Music Directors, and Mahler conducted several of his own works with the Philharmonic, including the U.S. Premiere of his Symphony No. 1 in 1909. The Mahler Festival 2020 will include performances of all of Mahler’s symphonies played by the New York Philharmonic, Vienna Philharmonic, Berlin Philharmonic, and Royal Concertgebouw Orchestra — all of which Mahler himself conducted and which will be heard together in Amsterdam for the first time.